22 - 24 april, Malmtorgsgatan 8, Brunkebergstorg (taket på Gallerian). 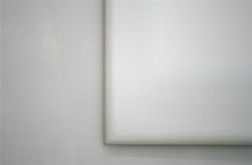 Per Kesselmar must be regarded as one of the most interesting upcoming painters in the minimalist genre. The inspiration from American minimalist artists like Robert Ryman and Agnes Martin is present but also connotations from more romantic color-field painters such as Mark Rothko or older times misty and diffuse landscape painters as, for example, William Turner. 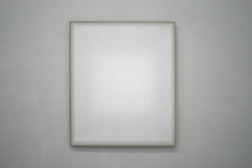 Per Kesselmar paints exclusively with the white color on metal plates. He mixes the white paint in an infinite number of shades and works with several extremely thin layers, beginning from darkness and paints towards light. His paintings are in optical oscillatory motion, they can appear to vibrate, to verge in the background wall or penetrate into the room. Per Kesselmars installations with steel sticks and a mixture of natural and artificial shadows sharpens our sight and spatial experience with very small gestures and expressions. 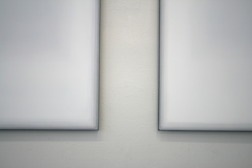 For the MARKET ART FAIR soloshow we present paintings with white oil paint on steel, with several thin layers of white paint in different nuances of white and installations with steel sticks, aquarelle paint and natural shadows as an important part of the piece. All together the pieces appears to be stretched in time and space. The works appeals as much to be about color and light as well as about shadow and darkness. With extremely simple and poetic mediums, the artist creates visual impressions and experiences at the painting's outer limits, artworks that occur temporarily on the retina at the moment here and now in a sublime way. The works of Per Kesselmar interacts with and challenges our sight and visions will emerge gradually for those who observe carefully. Per Kesselmar shows his fascination with light in his works. In his paintings, the Stockholm-based artist mixes different shades of white paint on large sheets of metal. In his sculpture, he works with the existing exhibition space to play with reality and to create an atmosphere for the viewer. 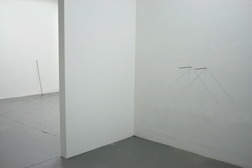 The following is an interview with Sabrina Möller, in which he explains his artistic process and his unique relationship with the viewer. In the 1990s, you were working with colors like yellow and orange, but now your works are dominated by different shades of white. How did that come to be? I have always been fascinated by light and very bright colors. That came very natural to me. Bright colors have been my main interest from the start. As a painter, I find it fascinating to create light… The most interesting to me is the sublime and to explore our perception: what we see and what we are. 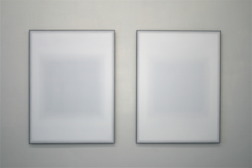 At first glance, your paintings seem to be mostly monochrome. But you work with different layers of white paint mixed with small quantities of other colors. In the documentary about your work I’ve seen that you mix these colors directly on the surface of the painting. Why is that? Could you tell me more about what the process looks like? Actually, I used to have all my fingers covered in paint, each a different color, which I then would mix with white. With the various colors, I can tune the white paint to a warmer or cooler tone, the way I want it to. I work in many layers and I work with the transparency to open up the space of the canvas and to see through it. Are there certain criteria as to which color will be next? No, the process is very intuitive. The material I work with is very important. I work with different kinds of metal. I choose colors that correspond with the material. Instead of using canvas, you paint on iron, aluminum, brass, etc. To what extent is the surface of the material important to you and to what extent does it define your work? I find metal very exciting to work on because of its flat surface. Moreover, metals like iron and lead appeal to me, because of there extreme contrast to the light. Metal also darker, which creates a dramatic contrast with the white. I always choose to show a bit of the material underneath at the edges. When did you start to develop this kind of formal language? Is there a kind of an origin moment? It was a moment when I was working on a copper plate print and I thought that the copper plate was actually much better than the print. That was at the Royal Academy in the 1980s. And since then I have been working like that. Where does the inspiration for your works come from? Do you have a certain idea in your mind or how do you develop the subject of the work? I want to give the viewer a sense of the present. The sublime present and the sublime reality of which we all are a part as humans. That is what I want to give the viewer. I also work with the existing room, shadows, and different kinds of objects which reflect light or make shadows. I play with reality to bring attention to what is happening in the here and now—a sort of way of guiding us to the present. The existence of light always implies the existence of shadows. You create light in your paintings, but on the other hand you create shadows with your objects, which interact with the exhibition space. Tell me more between the interaction of the objects and the space and the connection of light and shadows. I like to play with reality. The most important thing for me is to make an atmosphere for the viewer and not to create a single work. It’s about creating an atmosphere for the space into which you’re entering. I use the format of the exhibition to further play with reality, to paint shadows and to catch the viewer’s attention to what’s happening in the here and now. Repetition seems to be a key characteristic of your work. Would you agree with that? Yes, my work can be perceived as repetitive. Sometimes I feel like I’m working on the same painting year after year. However, the painting is never-ending. I see the multitude of paintings as a single continuous work. How important are aspects such as aesthetics to your work? Do you see your works as decorative to a certain degree? The decorative is perfectly fine with me, although I can’t say it’s my main interest. I don’t see the sublime as something decorative, but rather as a sense of belonging to the viewer. world-class contemporary art presented by the top Nordic galleries. In conjunction with an ongoing urban development project, the 2016 edition of the fair will be held at the brand new rooftop extension of Gallerian, the first mall built in Stockholm city centre in 1974. Market 2016 is a special edition focusing exclusively on solo presentations adapted to the temporary construction site nature of the venue, allowing further accessibility for the audience as well as reflecting Market´s continuous progress. By providing a platform, Market Art Fair is committed to support and strengthen the Nordic galleries and thus the continuous advancement of a vibrant art scene. Galleri Fagerstedt på Market Art Fair Stockholm i monter nr 16 på plan 11 22 - 24 april, Malmtorgsgatan 8, Brunkebergstorg (taket på Gallerian).